Sometimes, after using an APT process that transfers pitch of very different signals, audible problems in the output can occur. In these cases, examining the pitch measurement traces of the APT's Input and Output signals can be very helpful in determining what is causing the problem, and indicating how to corrected it. What happens when APT's pitch processing parameters are adjusted to be more tolerant of differences. In the example below, most of the Revoice Pro 4 APT Views (shown in the menu at right) are ON. This shows the pitch trace of the Guide signal (a flute) not easily seen and the orange Dub Energy block makes the Dub's pitch hard to see. There is simply too much information. This is easily dealt with. Note that APT Process Control Blocks need to be selected for all the following to work. Each of the following steps is optional - and depends on what the user wants to see. After this summary - there are further detailed explanations of the use of the controls. The energy traces can be simply removed by clicking the APT View "Energy" switch to OFF, which is shown in the image below. The Audio in all the tracks can be removed as well, by selecting "Audio" in the pop-up display menu (say in the Guide track) and, using the SHIFT key to apply the change to all the tracks, lower the waveform energy to the lowest level desired. (In the example below, it has been lowered to a flat line). The vertical sliders at the right of each track showing "Pitch" in pop-up selector can be moved to raise or lower the pitch trace to enclose or be centred on the vertical white lines showing where the pitch range is in the track's window. Further detail. The scaling of the pitch traces can be adjusted as well individually using the slider control in the pop-up. The Output or Input tracks can be expanded to full height to examine finer details of the pitch traces. Further detail. Doing the above can result in a cleaned up display similar to that shown below with all the Guide, Dub and Output pitch traces clearly (and the blue high pitch limit bar at the top of the guide track). 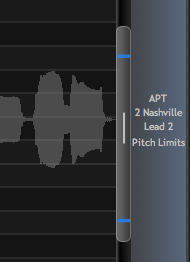 Further detail: An overview of the pitch trace range and pitch detector limits of the process are shown below in the right hand scroll bar if pitch or pitch limits are currently being edited. This can act as a navigation aid when trying to scroll and scale the display window so as to see the traces and limits concerned. The white line(s) in the centre of the scroll bar shown here represent the ranges where pitches have been detected, while the blue lines show the pitch limits of the process in relation to the currently scrolled and scaled display. If the white line touches the blue pitch limits, it would be advisable to increase or lower the appropriate pitch limits in the APT Control Panel for that track.